I wrote this over 10 years ago, after my father passed away. When necessary, I will edit the text for context and to conform with the reality of today. My childhood and early adolescence included summer trips from our home in Salt Lake City to our summer house in Hydra, which in the early 1980s presented a huge contrast in socio-economics, culture, and lifestyle. Through a child’s, youth’s, and eventually an adult’s eyes, I also witnessed the impact of tourism on our little island, the fitful transformation of Greece from a Third World to a First World country, and the dueling emotions of dual nationality. My late father always wanted a home in Hydra, the island of his birth and his constant emotional home. Though he moved with his family to Piraeus, like so many of his fellow islanders, he always returned for summers and holidays. Even after immigrating to America, he always missed his island, and in 1977, my parents purchased a home on the island, and nearly every summer we traded life in the US for the Aegean summers of Hydra. My father was very proud of his island. Despite its diminutive size, Hydra, like many Greek islands, is its own world, and emphasises the great diversity, rather than uniformity, of Greece’s 2,000 islands. Hydra possesses little of Greece’s Classical or Byzantine history; the rocky island always supported a few pastoralists who have left behind coins or artifacts but no monuments of any note. Hydra’s glory and monuments are recent, yet fundamental to the Greek state we know today. Hydra’s settlers came from the Peloponnesian mainland six kilometers away in several waves. A large demographic element was Orthodox Christian Albanians (Arvanites) and the street language of the island remained Arvanitika until the early 20th century. The biggest immigration to the island followed the failure of the Orloff Uprising against the Turks in the Peloponnese in 1770. Necessity often fosters upward development, and pastoralism and farming could hardly support the growing population, so like Greeks from time immemorial, the Hydriots turned to the sea. They were quick studies. By the Napoleonic Wars, in the early 1800s, they boasted one of the largest fleets in the Mediterranean and Black Seas. The Hydriots grew rich running the British blockade of French ports, and one wily captain, Andreas Miaoulis, upon his capture by the British, so impressed their commandant, the great Admiral Horatio Nelson, that he freed the “pirate,” promising him a swift hanging if they ever met again. Miaoulis went on to become one of Hydra’s principal admirals when the struggle for freedom came. Hydriot shipowners and captains poured capital into their ships and spent some of their money on stately yet measured mansions that still dot the harbour area and prominent vistas in the town, some in a state of disrepair and others renovated, sometimes by descendents but more likely by wealthy purchasers. Hydriots also benefited from increased Russian intervention on behalf of their Orthodox brethren, and their ships had the right to fly the Russian flag and thus obtained the Tsar’s protection. The Hydriots’ wealth and seafaring prowess also earned them a degree of autonomy from the Turks, at the price of a periodic blood tax on their best sailors. Hydra’s Patron Saint, St. Constantine, was a repentant Janissary who returned to his Orthodox faith and as a result met martyrdom at the hands of the Turks. The vast commercial space of the Ottoman and Russian Empires, together with the demand from Western Europe rebuilding from the Napoleonic Wars, ensured good times for Hydra, notwithstanding the humiliation and gall of Turkish rule. When the Greek War of Independence began, in 1821, the Hydriot shipowners prevaricated a bit. They had a great deal at stake and enjoyed many benefits as Ottoman subjects, as the Turks were poor sailors and mediocre merchants. Greek national feeling prevailed, and popular sentiment led by a minor captain, Antonios Economou, brought Hydra into the revolution, where she joined the other “Nautical Islands,” Spetses and Psara, in battling the Turkish fleet. Hydra furnished the most ships, carried the battle against the Turks throughout the Aegean and Ionian Seas, and even attempted unsuccessfully to burn the Egyptian fleet in Alexandria. Eventually, after an epic struggle and plenty of internecine fighting, Greece won her freedom, and an exhausted Hydra emerged depleted of everything except honour. Most of her fleet was at the bottom of the sea, her fortunes drained in the struggle, and many a stalwart met a watery end in those eight years. At the height of the War of Independence, 33,000 people lived on the tiny, rocky island, including much of the population of neighbouring Spetses that was threatened by the Turks. My father was born in 1924, at a time when Greece reeled from the disaster of the Greek-Turkish War of 1920-1922 and the absorption of 1.5 million refugees. Hydra’s poverty mirrored the rest of Greece, which then suffered the bloodletting and torment of World War II and the Civil War. Like most islanders, he served in the Greek Navy and then in the Merchant Marine. As did so many Greeks in the 1950s, he became an American landlubber after finding the love of his life in America. While Greece struggled with the torment of Cold War politics, underdevelopment, and reconstruction, the post-war economic growth and social policies in the West that encouraged tourism brought new visitors to Hydra, armed with Deutschmarks, Francs, Pounds, Kroner, Yen, and Dollars. Others brought an easel or pen and paper, as the cubist architecture and amphitheater port inspired artists and writers. Others brought—or wore—little or nothing at all. Suddenly the impoverished Hydriots, conservative and cagey, began to rub shoulders with beatniks, bohemians, intellectuals, nudists, mass tourists, and the jet set, an unsettling cocktail with profound effects both positive and negative. Hydra’s rediscovery had many parallels in the Mediterranean, or indeed anywhere tourism and style “discover” a place. 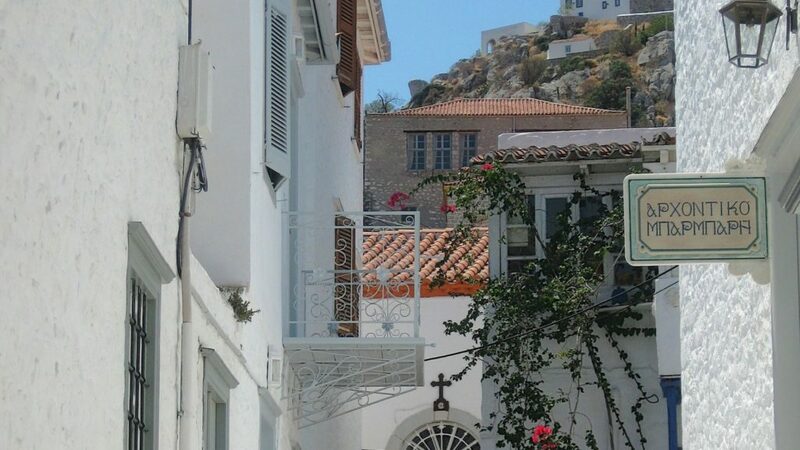 Hydra’s time warp of winding streets, crumbling mansions, and peasant population met the modern world full frontally. Similar situations happened in Spain, Italy, and Portugal, all of which had similar poverty, and both Spain and Portugal had very recent memories of dictatorship. Greeks, fighting against a dictatorship and rightly fearing an encroaching Turkey six times their country’s size, also had to welcome tourists with more money, more freedom, and fewer hang-ups than they had, whose governments often supported the dictatorship or even worse, supported Turkey. As much as they needed the tourists, they resented them. Enter the Amerikanakia . . .
My father bought a house in 1977 on Hydra, a crumbling yellow home that he and my mother quickly reduced to its stone structure and remodeled, with many of the latest American-style wrinkles. I was eight years old, and I considered myself to be a Greek. After all, my parents were Greek, I spoke Greek, and my father was a local. Really? Not to my peers on the soccer field, on the beach, or in the port. I was an American, and somehow my being Greek meant I felt the full brunt of my differences. I felt the same way, I am sure, many Greek Americans (or Greek Australians) felt—caught in the middle. As Greeks, we felt many of the same resentments, but as diaspora Greeks we did not know the daily grinds and challenges of life in Greece, particularly in times of political trauma. As Americans, we also knew of life in America and realised that to view America through a narrow prism was incorrect. A nation my father taught me to revere did not accept me, at least in the eyes of the locals. Patrick Leigh Fermor, the British hero of the Greek Resistance, one of Greece’s finest biographers and a resident of Mani for 45 years, told Robert Kaplan in Mediterranean Winter that to be viewed as ‘autochthonous’, you had to spend at least a winter in Hydra. “Only then do the locals accept you.” Rather than a two- or three-month holiday experience, the locals wanted you to have ‘bread and salt’ with them, when the wind howls incessantly, and the Aegean storms make the port unusable. That, even for a Greek, marked the transition from tourist to resident. Fermor’s observation made great sense to me and helped me to come to terms with my identity as a diaspora Greek. I would come to know Greece as a local when we moved there for a couple of years, but the ‘Greek Reality’ was too much to bear for more than a couple of years. As it happened, I never had the chance to experience Hydra itself up so close, so I remained an observer of Hydra in the high season over the period of nearly four decades. During that time, I remember summers when the ‘paralia’ (port promenade) was so packed with strollers and revelers, that it resembled a carnival, and other summers when economics or, it is said, the gouging prices charged by local merchants kept the tours away. Over the period from, say 1977 to 1997, Hydra changed from a place where a telephone required two years’ wait and a hefty bribe, to a place where the ‘kinito tilephono’ was ubiquitous. Albanian returned to the streets of Hydra, not because the locals re-learnt the Arvanitika dialect of their grandparents, but because hundreds of Albanians live and work on the island, slowly merging into the Balkan Orthodox soup of Greece. Greece regained confidence as an emerging hub for the Balkans, an established EU member, and with better relations with archenemy Turkey. Living standards were high enough to induce Greeks (and one million foreigners) to return, rather than to immigrate. We returned as well—for a while. The last time I went to Hydra, in 2012, the sense of decline was palpable, but the global draw of Hydra was somewhat of a shield against the full bite of the Greek crisis. For my part, I learned to embrace my dual nationality as a Greek and an American, and my search for knowledge about my homeland and its cultural-geographic space took me all over the Balkans and Europe. The formative ferment I experienced in Hydra induced me to study internationally, to major in East European Studies in college, and to study intensively the Balkan Orthodox world. I revel in the dual identity I possess, and in the larger Balkan Orthodox milieu of our Greco-Serbian home and our child. I thank my parents for this incredible formative experience. I also am thankful for the chance to have experienced Greece as a local, and to know why I must be a Diasporan. As for my father, the Hydriot, he never tired of Hydra, all its warts seemed to him either beauty marks or marks of character, though he always had a deep, brooding concern and fear for Greece’s future-well founded, as it turned out. Into his 60’s and 70’s, he paid yearly, often several month-long visits to the island, drinking in its atmosphere and fellowship, even as he argued with bureaucrats, unscrupulous shopkeepers, and local philosophers nearly every day. My favourite image of him is in his late 70’s, during the summer of 2000, standing in the port, sporting khaki sun hat, shirt, and shorts, ready for a trek to his favourite beachside taverna in Vlichos Cove. Less than five years later, in August 2005, the Lord liberated him from the earthly chains of Alzheimer’s Disease, which for the last three years had robbed him of his wit, charm, intellect, and command of poetry. Now he sees Hydra from a loftier, more peaceful perch.